58 MARCH 2015 COATINGSPROMAG.COM on the coating to ensure that there was adequate resistance to alternating currents. Te results showed that the coating met the requirements for withstanding the maximum strength of 13,200 volts of alternating current (AC). A ll of that means that the coating of the new pipeline would not negatively afect the protection of the existing pipeline. Terrain But No Rain Te crew started by preparing the pipe to NACE No. 1/Society for Protective Coatings (SSPC) Surface Preparation (SP) 5: W hite Metal Blast Cleaning. 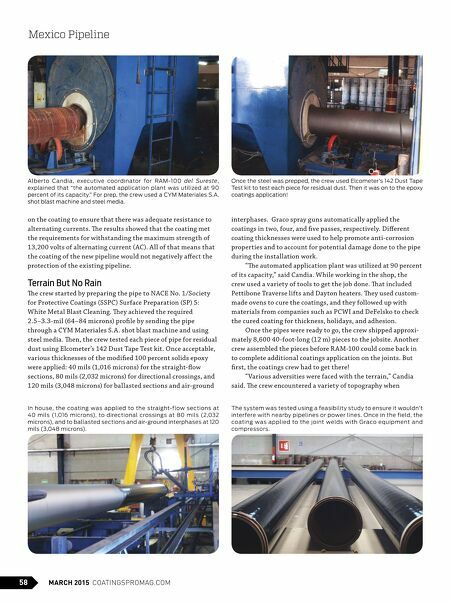 Tey achieved the required 2.5–3.3-mil (64–84 microns) profle by sending the pipe through a CYM Materiales S.A. shot blast machine and using steel media. 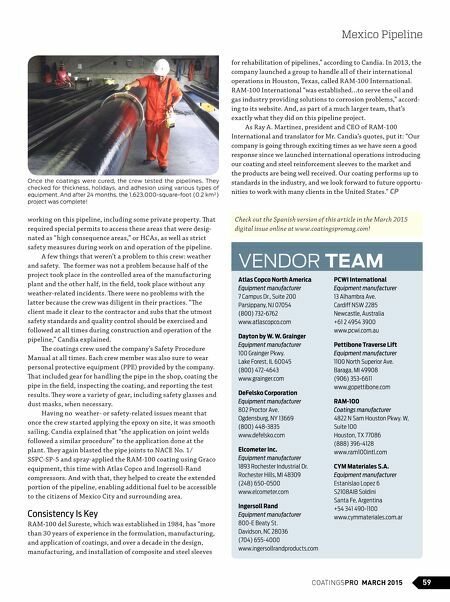 Ten, the crew tested each piece of pipe for residual dust using Elcometer's 142 Dust Tape Test kit. Once acceptable, various thicknesses of the modifed 100 percent solids epoxy were applied: 40 mils (1,016 microns) for the straight-fow sections, 80 mils (2,032 microns) for directional crossings, and 120 mils (3,048 microns) for ballasted sections and air-ground interphases. Graco spray guns automatically applied the coatings in two, four, and fve passes, respectively. Diferent coating thicknesses were used to help promote anti-corrosion properties and to account for potential damage done to the pipe during the installation work. "Te automated application plant was utilized at 90 percent of its capacity," said Candia. W hile working in the shop, the crew used a variety of tools to get the job done. Tat included Pettibone Traverse lifts and Dayton heaters. Tey used custom- made ovens to cure the coatings, and they followed up with materials from companies such as PCWI and DeFelsko to check the cured coating for thickness, holidays, and adhesion. Once the pipes were ready to go, the crew shipped approxi- mately 8,600 40-foot-long (12 m) pieces to the jobsite. Another crew assembled the pieces before R AM-100 could come back in to complete additional coatings application on the joints. But frst, the coatings crew had to get there! "Various adversities were faced with the terrain," Candia said. Te crew encountered a variety of topography when Alberto Candia, executive coordinator for RAM-100 del Sureste, explained that "the automated application plant was utilized at 90 percent of its capacity." For prep, the crew used a CYM Materiales S.A. shot blast machine and steel media. Once the steel was prepped, the crew used Elcometer's 142 Dust Tape Test kit to test each piece for residual dust. Then it was on to the epoxy coatings application! Mexico Pipeline The system was tested using a feasibility study to ensure it wouldn't inter fere with nearby pipelines or power lines. Once in the field, the coating wa s applied to the joint welds with Graco equipment and compressors. In house, the coating wa s applied to the straight-flow sections at 40 mils (1,016 microns), to directional crossings at 80 mils (2,032 microns), and to ballasted sections and air-ground interphases at 120 mils (3,048 microns).